Several UCF Global Perspectives Office staff, interns and fellows learned about “Development, Diplomacy and Defense (D3): Opportunities in Latin American & the Caribbean” at the 2013 Florida International Summit recently. The event was hosted by USF in Tampa and co-sponsored Feb. 28 by the Florida Network for Global Studies. The network is a consortium of Florida universities that aims to advance the exchange of information on economic, political, social and technological change taking place in an increasingly globalized world. The opening address was delivered by Loch K. Johnson, Regent’s Professor at the University of Georgia and Southeastern Conference Professor of the Year. Commenting on the CIA’s regional role in defense, Johnson discussed several myths about the impact and oversight of covert action. He concluded that these secret missions happen with increasing frequency and little accountability, and that the strikes are not as “surgical” as many Americans may believe. Ultimately, Johnson called for more judicious oversight to ensure that global threats can be addressed without compromising American values. A panel presentation followed with perspectives on D3 in Latin America and the Caribbean. USF political science professor Harry E. Vanden shared his research on “maras” or neighborhood gangs in ungoverned spaces in Latin America. UF anthropology professor Marianne C. Schmink discussed socio-environmental grassroots experiments in Amazonia. Next to speak was USF professor and State of Florida 21st Century World Class Scholar for Civil and Environmental Engineering James R. Mihelcic. He works with small, urbanizing cities in the region to rethink of waste water as a resource instead of a byproduct. Finally, USF public health professor Ricardo F. Izurieta discussed trends in controlling epidemics and pandemics in Latin America. Despite the variety of topics covered in the panel, one theme was prevalent throughout: the fluidity of borders. In the region, crime, eco-zones, trade and viruses span across borders such that one country’s success or failure is felt by its neighbors. The next panel addressed disaster management and its impact on development in Latin America and the Caribbean. Kay C. Gross, president of World Disaster Management and former associate director of FEMA, compared countries’ responses to disaster. While Ecuador has a track record of reaching out for help, Haiti drove away nongovernment organizations after its devastating earthquake 2010, she said, because they charged a fee for outsiders to operate there. Pietro Marghella, a senior partner at Disaster Preparedness Resources and lecturer at George Washington University, emphasized the region’s susceptibility for “hydrological, meteorological and tectonic events.” He stressed that with preparedness, these natural hazards do not have to become disasters. USF Vice Provost Graham Tobin doubled as a moderator and panel presenter. He described how one event, such as the Tungurahua Volcano’s 2006 eruption in Ecuador, may only directly prove fatal for a handful of people, but that the cascade of events, such as the loss of crops to ash, can devastate a nation. The underlying message from all three presenters was that effective disaster management requires international cooperation, and the incorporation of physical and social science experts to guide preparedness efforts. “Drug money finances terrorist organizations,” he said, “and our problem has a huge effect in the world. 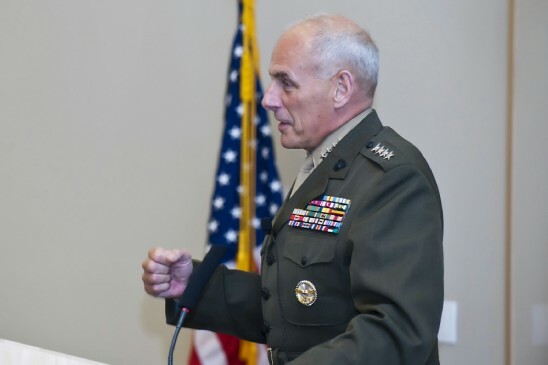 Honduras is on the brink of becoming a ‘narco state.’” Kelly commented that the epidemic of crime and murder in Central America tramples on human security. “SOUTHCOM’s engagement has got to be focused on human rights. Justice is needed for these people,” he said. When asked by UCF student and Diplomacy Fellow Lucien Charland if the sequestration of funds would have an impact on SOUTHCOM’s ability to fight the drug trade, Kelly answered that it would. He mentioned the target number of 14 naval vessels to enhance the U.S. response to traffickers, but lamented that his current fleet of four would likely be cut. The participating institutions of the Florida Network for Global Studies are FIU, FSU, UCF, UF, UNF and USF. More information is available at www.floridaglobalstudies.com. In addition to USF and Florida Network for Global Studies, sponsors of the event included USF World, USF ResearchOne, UF Center for International Business Education and Research, USF Institute for the Study of Latin America and the Caribbean, and the Global Connections Foundation.